Carlos Spencer will make his Gloucester debut against Sale Sharks at Kingsholm on Saturday. Spencer joined Gloucester from Northampton Saints two weeks ago and will now put his mind to helping the Cherry and Whites to consolidate top spot in the Guinness Premiership. Spencer partners Rory Lawson at half-back and Olly Barkley returns to No.12 and partners Matthew Watkins in the centre. Iain Balshaw shifts to fullback and is joined in the back-three by James Simpson-Daniel and Mark Foster. "The impact Carlos has had has been immediate - he brings an energy and vitality to what we are trying to do and the squad has responded to that really well," said Gloucester head coach Dean Ryan. 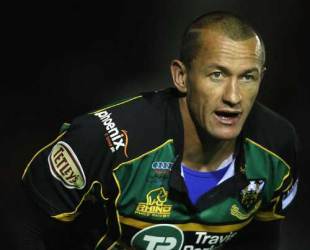 "He has a fantastic understanding of what makes a team operate and it will be great to see him in a Gloucester shirt. He is one of those players that makes things happen and that is very exciting prospect. "The lift he has given us is significant this week, although there has obviously been a lot to cover. We have everyone who is fit and available involved this weekend - with international call-ups and injuries we have been stretched to the limit." Nick Wood starts in the front row alongside skipper Olivier Azam and tight-head Greg Somerville. Lock Will James returns from a hamstring injury and starts in the second row alongside Alex Brown and Apo Satala moves to blindside flanker with Andy Hazell at openside and Gareth Delve at number eight. "Sale are one of the main contenders, not just for the top spot in the regular season but also for a play-off place so we expect an extremely tough examination," Ryan said. "Their season has been built around an outstanding start and an exceptional defence. They will also have guys away on international duty but they have competed at the top end of the competition for a long time so will know exactly what is expected. Sale Director of Rugby Kingsley Jones has named a strong side for the trip to Kingsholm, with Chalrie Hodgson partnering Richard Wigglesworth at half-back and All Black Luke McAlister slotting in at inside-centre. Sale have not won at Gloucester since 2000 but will have their sights set on a win over the Premiership leaders. With a game in hand, Sale could go three points clear of Gloucester at the top of the table if they register a bonus point. Juan Martin Fernandez Lobbe starts at No.8 alongside Chris Jones and Luke Abraham while Sean Cox takes the place of Sebastien Chabal in the second-row as the Frenchman ins on international duty. "This is a huge game for us; Sale Sharks have not won at Kingsholm since 2000 although we have been close to winning on a couple of occasions," said Jones. "I spent some memorable years at Gloucester, it's a good club with a very loyal fan base. They love their rugby there and they currently lead the Premiership. It promises to be a good game and like Worcester a fortnight ago we need to respect the opposition, show patience but we also need a strong referee throughout the eighty minutes." Gloucester: Iain Balshaw, Mark Foster, Matthew Watkins, Olly Barkley, James Simpson-Daniel; Carlos Spencer, Rory Lawson; Nick Wood, Olivier Azam (capt), Greg Somerville, Will James, Alex Brown, Apo Satala, Andy Hazell, Gareth Delve. Replacements: Andy Titterrell, Jack Forster, Adam Eustace, Dan Williams, Ryan Lamb, Anthony Allen, Charlie Sharples.